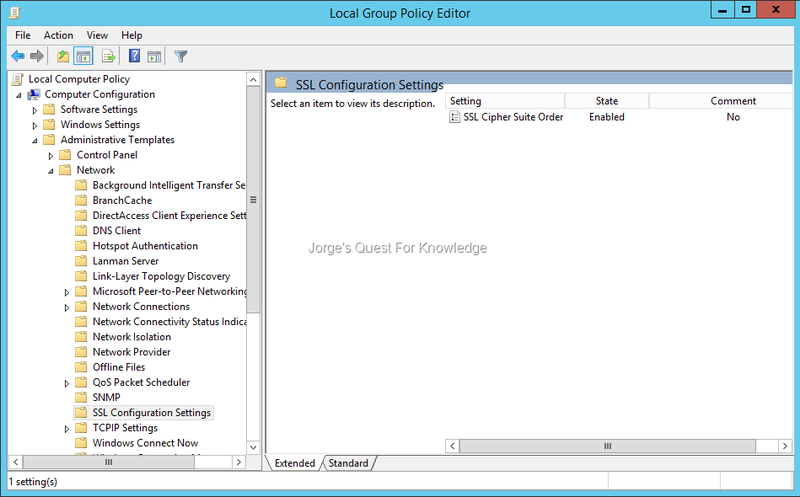 Azure AD Application Proxy Connector « Jorge's Quest For Knowledge! This post is about disabling weak ciphers, hashes, cipher suites and protocols in ADFS, WAP, AAD Connect, Azure AD MFA server and Azure AD Application Proxy Connector server. The main focus however, is disabling weak protocols in ADFS, WAP, AAD Connect, Azure AD MFA Server and Azure AD Application Proxy Connector server as these systems play a very important part in the hybrid solution with Azure AD and its backend services. Please be very careful with these settings when hardening your systems and make sure to test first!!! For quite some time now, SSL v2.0, SSL v3.0 and TLS v1.0 should be disabled and not be used anymore. Especially with disabling TLS v1.0 you may/will experience some challenges that need to taken care of. It may seem difficult to disable TLS v1.0, but it is not impossible. Just do your research! Mailbag: What version of the .NET Framework is included in what version of the OS? As a starting point for this blog post I do assume that every client/server is up to date with the patches available through Windows update! As soon as you disable TLS v1.0 on W2K8R2 and higher, the RDP client on Windows 7 and Windows Server 2008 R2 breaks. For Windows 7 and Windows Server 2008 R2 the hotfix Update to add RDS support for TLS 1.1 and TLS 1.2 in Windows 7 or Windows Server 2008 R2 exists to add support for TLS v1.1 and TLS v1.2 for RDP client on Windows 7 and Windows Server 2008 R2. The RDP client on Windows 8/8.1 and Windows Server 2012 (R2) and higher is not impacted. Looking at both ADFS and AAD Connect, both can use SQL server for their data storage. If ADFS is using WID, from my experience, you do not need to do anything in addition. 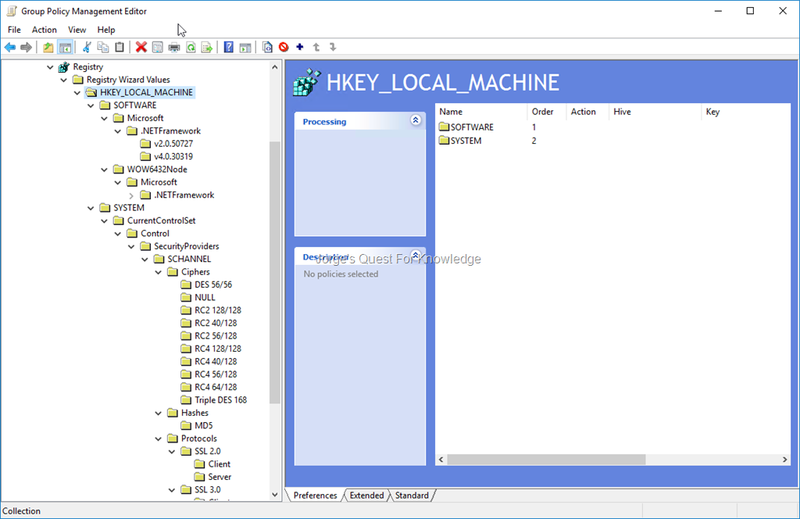 If you have installed AAD Connect without SQL server, then you are using SQL Server 2012 Express LocalDB (a light version of SQL Server Express). I do not fully understand why, but in my case the Azure AD Sync service did not start anymore. Exporting the custom sync rules, uninstalling AAD Connect, rebooting the server, reinstalling AAD Connect and importing the custom Sync rules and everything was fine again. Don’t ask why or how. Maybe a coincidence! However, if either ADFS or AAD Connect is using SQL server, make sure to patch SQL server so that it supports TLS v1.2. More information about this can be found in TLS 1.2 support for Microsoft SQL Server. If SQL Server is running on W2K8R2, then TLS v1.1 and TLS v1.2 are supported, but it is disabled by default. You will have to enable it through the following commands and reboot the server afterwards. If SQL Server is running on W2K12 or higher, then TLS v1.1 and TLS v1.2 are supported and enabled by default. W2K8 does not support TLS v1.1 or TLS v1.2. You will have move away to a more recent server OS version. W2K8R2 does support TLS v1.1 or TLS v1.2, but it is disabled by default. You will have to enable it through the “REG ADD” commands or using the IISCRYPTO tool and reboot the server afterwards. W2K12 does support TLS v1.1 or TLS v1.2 and it is enabled by default. Explicitly enabling it does not change or hurt anything. When connecting to Azure AD, TLS v1.0 is used by default. This can be changed to start using TLS v1.2 instead. Azure AD by default supports this. The Azure AD Connect server depends on .NET Framework 4.5.1 or later. Whichever version you have installed, you need to install a patch for it, unless you are already running it on W2K16 or higher. If you are running W2K8R2, W2K12 or W2K12R2 you need to install a patch. Which patch you need can be found in Microsoft Security Advisory 2960358. 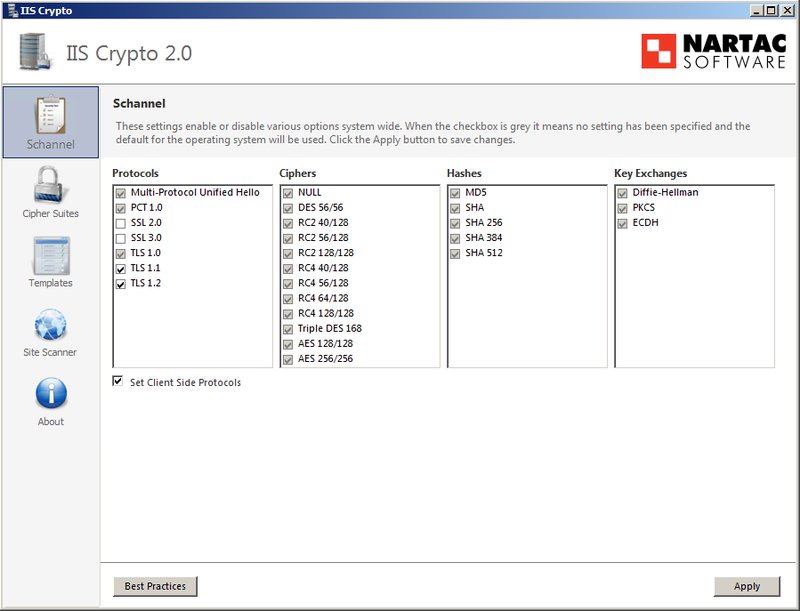 W2K3 and W2K8 do not support TLS v1.1 or TLS v1.2. You will have move away to a more recent server OS version. The Azure AD MFA server depends on .NET Framework 4 or later. Whichever version you have installed, you need to install a patch for it, unless you are already running it on W2K16 or higher. If you are running W2K8R2, W2K12 or W2K12R2 you need to install a patch. Which patch you need can be found in Microsoft Security Advisory 2960358. The AADAppPrx server depends on .NET Framework 4 or later. Whichever version you have installed, you need to install a patch for it, unless you are already running it on W2K16 or higher. If you are running W2K12R2 you need to install a patch. Which patch you need can be found in Microsoft Security Advisory 2960358. In this setup I will have a secured ADFS server (ADFS v3.0 or ADFS v4.0) which will be configured to only support stronger protocols and no weak protocols. I will have other remote ADFS servers, clients, applications, etc. with which the secured ADFS server needs to communicate with in any form (e.g. read metadata through URL from remote ADFS servers and/or applications). The other way around the remote ADFS servers, WAP Server, clients, applications, etc. need to communicate with the secured ADFS server to read its metadata/configuration or deliver or get a security token. In the case the secured ADFS server needs to communicate with SQL server, than if above in the section “SQL Server”. The idea here is also to configure remote servers/clients to be able to use TLS v1.1 and TLS v1.2 against the secured ADFS/WAP servers, but NOT to disable TLS v1.0 on them. This is about what you need to do at least on other systems if you secure one specific ADFS/WAP farm. 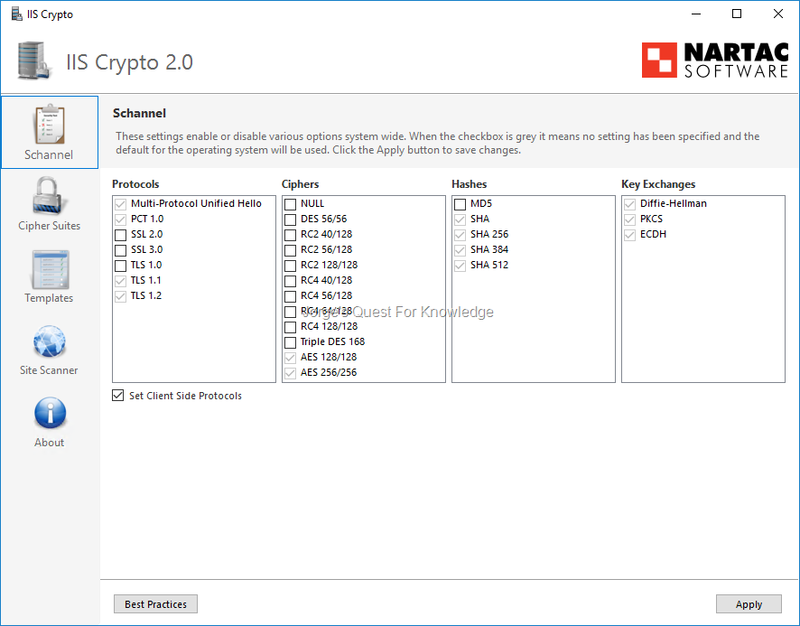 .NET is hardcoded to use TLS v1.0 by default. For W2K12R2 and W2K16 you need to tell .NET to use the stronger protocols. That is done by executing the commands below to set the required registry settings. However, for W2K12R2 you must install some patches first to be able to tell .NET to use the stronger protocols in use by the OS. For that see Microsoft Security Advisory 2960358 (probably MS-KB2898847 and MS-KB2898850). For W2K16 you do not need to install the patches. You only need to configure the registry settings . After configuring all this, DO NOT forget to reboot the ADFS/WAP servers! Internet Explorer must be configured to support TLS v1.1 and TLS v1.2 if not already enabled by default. 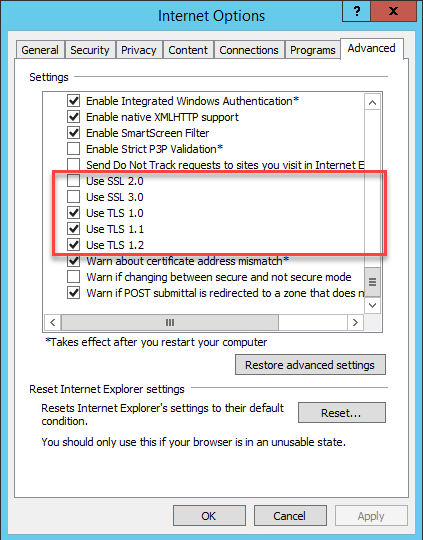 Firefox must be configured to support TLS v1.1 and TLS v1.2 if not already enabled by default. Chrome must be configured to support TLS v1.1 and TLS v1.2 if not already enabled by default. Yes, you guessed it correctly. Chrome inherits these settings from IE! W2K8R2 by default supports TLS v1.1 and TLS v1.2, but it is disabled by default. Therefore you need to enable it. You can use the following commands to do so. 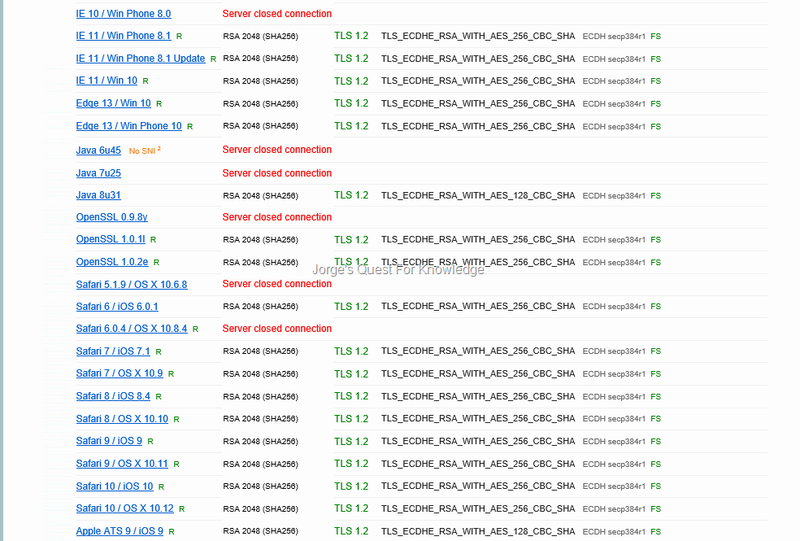 After configuring all this, DO NOT forget to reboot the ADFS v2.0 servers! W2K12 by default supports TLS v1.1 and TLS v1.2 and it is also enabled by default. Nothing to do for that. I think you do need to install the hotfixes listed in Microsoft Security Advisory 2960358 (probably MS-KB2898845 and MS-KB2898849). However, you still need to tell .NET to use the stronger protocols in use by the OS. That is done by executing the following commands to set the required registry settings. 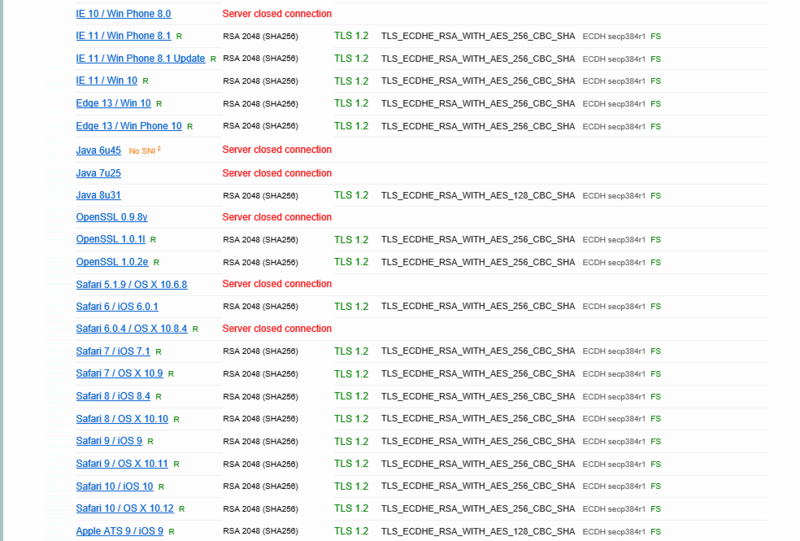 After configuring all this, DO NOT forget to reboot the ADFS v2.1 servers! W2K12R2 by default supports TLS v1.1 and TLS v1.2 and it is also enabled by default. Nothing to do for that. However, I still needed to tell .NET to use the stronger protocols in use by the OS. That is done by executing the following commands to set the required registry settings. After configuring all this, DO NOT forget to reboot the ADFS v3.0 servers! W2K16 by default supports TLS v1.1 and TLS v1.2 and it is also enabled by default. Nothing to do for that. No need to install patches for this. 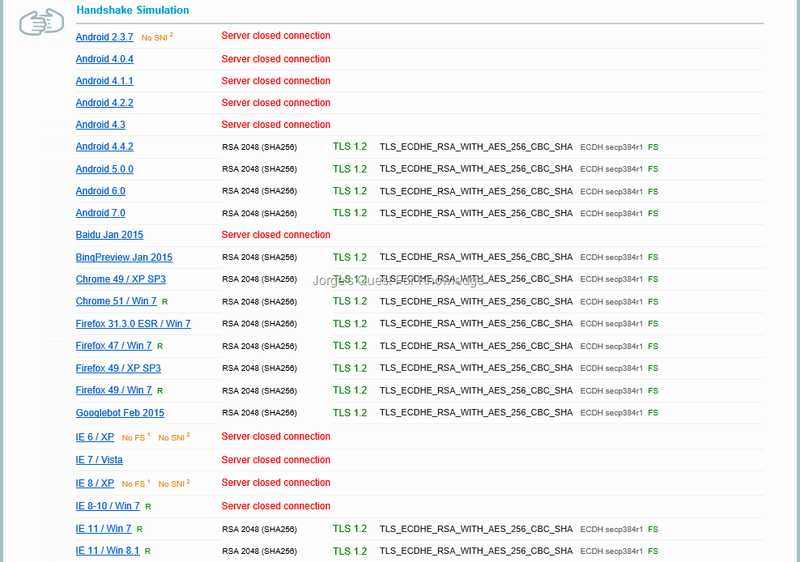 After configuring all this, DO NOT forget to reboot the ADFS v4.0 servers! Just make sure the connected application/federation system supports TLS v1.1 and TLS v1.2 as a server. You may need to contact system owners and/or vendors and ask if their system supports TLS v1.1 and/or TLS v1.2. 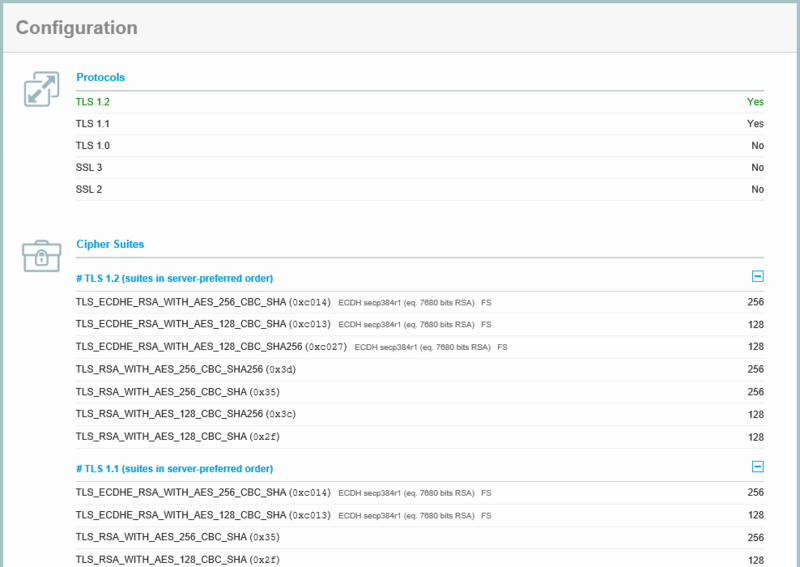 You can also setup a separate secured ADFS server and try to read its metadata from the application/federation system. If it succeeds it most likely does support TLS v1.1 and/or TLS v1.2. At the time of writing, it looks like Azure AD Connect Health DOES NOT support TLSv1.1/v1.2 only. It appears to need TLSv1.0 <== NOT TRUE! "A fatal alert was generated and sent to the remote endpoint. This may result in termination of the connection. The TLS protocol defined fatal error code is 70. The Windows SChannel error state is 105."